The BJP's Gujarat unit is geared to win all 26 Lok Sabha seats from Gujarat after declaring Gujarat Chief Minister Narendra Modi as its prime ministerial candidate, BJP's Gujarat unit general secretary and chairman of the Gujarat Finance Board Vijay Rupani said today. Rupani was in the city to address a meeting of mayors and presidents of 41 civic bodies from Central Gujarat here today. Reacting to a journalist's statement that despite projecting senior BJP leader L K Advani as its prime ministerial candidate during the 2009 Lok Sabha polls, the BJP won only 15 out of 26 Lok Sabha seats in Gujarat then, Rupani said, "At that time Modi was was not projected as BJP's prime ministerial candidate. 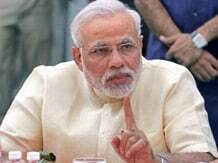 The people of Gujarat are very excited and eager to see Modi becoming Prime Minister". "We have chalked out our strategy keeping in mind how to defeat the designs and plans of the Congress and prevent it from winning any of the 26 Lok Sabha seats during the general elections in Gujarat," he said. "We do not attach importance to threats by Delhi Chief Minister Arvind Kejariwal led Aam Aadmi party and Sharad Pawar led Nationalist Congress Party to put up their candidates for all the 26 seats, since both the parties have no base in Gujarat," he said. He said that the Gujarat Finance Board's annual budget has gone upto Rs 5500 crore from Rs 110 crores in 2001 after Modi took over the reins of Gujarat in 2001. The board has been giving financial assistance to 159 local civic bodies and eight municipal corporations across Gujarat for carrying out various projects related to drinking water, drainage as well as road and toilet construction. Each of the eight municipal corporations got financial assistance of Rs 500 crore from the board every year, he said.